Dark Tallon Metroids are Tallon Metroids possessed by the Ing. They attack by draining energy from their prey and will feed on a variety of creatures. If one latches onto Samus, she can remove it with a Bomb. Samus encounters them in Dark Agon Wastes, the Ing Hive, and the Sky Temple Grounds. After possession, Dark Tallon Metroids inherit the Ing's vulnerability to the Light Beam. However, like other Metroids, Samus can still freeze them with the Dark Beam then shatter them with Missiles. The Ing are fascinated by Metroids and their connection to Phazon. It is not a shared fascination, as the Metroids will attack the Ing on sight. Recognizing their strength, Ing darklings have possessed a number of Metroids, turning them into powerful soldiers of the Horde. 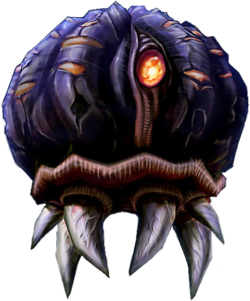 Dark Tallon Metroids and Metroid Prime are the only Metroids not native to SR388 that have a recognizable optical organ. This page was last edited on 8 April 2013, at 05:12.